Can I get married on a tourist visa? You are here: Immigration Idaho >> Marriage Immigration >> Marriage Immigration FAQS >> Can I get married on a tourist visa? Enter the United States on a tourist visa or the visa waiver program, get married and then remain in the United States and attempt to adjust status to that of a lawful permanent resident (LPR). In most circumstances, you can enter the United States, get married and then return to your home country. But, getting a tourist visa, or entering the United States on a tourist visa or the visa waiver program, for the purpose of getting married can be difficult. This is because you cannot enter the United States in this way if you are planning to remain in the United States as an immigrant. If you plan to get married, it may be difficult to convince the consular officer and border control officer that you only plan to stay for your wedding and then will be returning to your home country. You should be prepared to present whatever evidence you can to show that you will not remain as an immigrant. This evidence can include items such as a return plane ticket, lease agreements and letters from employers. I encourage you to consult with an immigration lawyer to make sure that you will have the least difficulty in getting married in the United States before returning back to your home country to apply for an immigrant visa. The second option should not be attempted. This is because you are not allowed to use a tourist visa or the visa waiver program to enter the United States if you really plan on staying as an immigrant. If you get married after entering on a tourist visa or the visa waiver program, you will need to prove that you did not enter the United States with an immigrant intent. This can be very difficult to prove. If you are found to have entered with immigrant intent, you may face severe penalties because you may be found to have committed visa fraud. 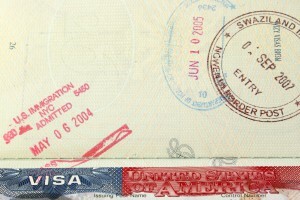 These penalties can include deportation and restrictions on being able to return to the United States in the future. Because you risk these severe penalties, you should consult with an immigration lawyer if you get married after entering the United States as a tourist or on the visa waiver program and plan to remain in the United States and adjust status to that of lawful permanent resident (LPR).